One of the things all educators need is to rest and relax with our family and friends and focus on what is most important in our lives. It’s also important to recharge our batteries from the day-to-day grinding work as leaders and spend a few quite minutes reflecting. 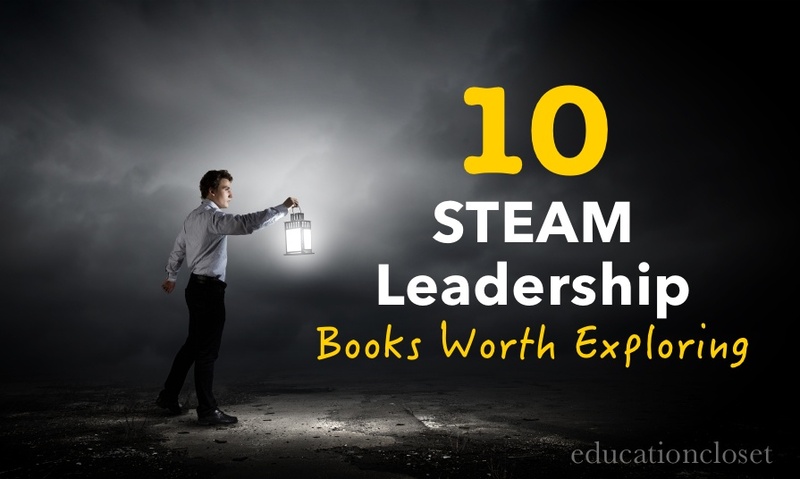 As you think about your work and your current state of STEAM/Arts Integration implementation we have compiled a list of leadership books worth exploring. Similar topics will be further explored by some of the most innovative leaders in STEAM/Arts Integration at our upcoming STEAM Connectivity Conference . The Harvard School of Education always produces practical resources for school leaders. The Change Leadership Group has worked with a host of educators to develop an approach to transform schools at a time of increased accountability. This book provides a thoughtful framework to investigate the demanding work of school change and activities that leads educators in the development of their own practices as leaders of change. A great support for leaders and leadership teams to deepen their implementation. Patrick Lencioni writes a lot about building healthy organizations and has some great resources for leaders. This book offers a leadership fable while exploring the interesting and complex world of teams in organizations. Lencioni tells the story of Kathryn Petersen, a CEO that faces a familiar challenge among leaders which is the unification of a dysfunctional team. The author gives insight into the five dysfunctions of a team and illustrates a simple model and action steps that can be implemented to build a thriving and cohesive team in any organization. Author, Tony Wagner is well-known for his work in the field of education. In this book he makes the case why its important to develop a innovation-driven economy and what society must do to produce students as 21st century innovators. Wagner illustrates what educators, parents, businesses, and community leaders can do to support children with their creativity and imaginations while teaching them to persevere through struggles and failure. The author explores some of the most innovative schools, colleges, and working environments where educators and employers are creating a culture of innovation and 21st skills. A must read! EducationCloset CEO and author, Susan Riley explores the necessary framework and steps for brining S.T.E.A.M. to life in K-12 Schools. In this book, she opens the door for encouraging educators to do what’s best for children to foster creative thinking and problem-solving in their schools. By integrating S.T.E.A.M. (Science, Technology, Engineering, the Arts, and Mathematics) educators can leverage the resources to make learning relevant and meaningful for every child. A practical guide for leaders to see how the process works for building a culture of integration and innovation in your school or district. In today’s educational landscape change is the constant norm. In this book, authors Gregory Shea and Cassie Solomon explore some of the major components why change efforts fail and how you can make the next change initiative be implemented successfully. One of the major components the authors site over and over is the fact that real change means changes in human behavior and that the greatest challenge to any change is often the work environment. The book guides you through the eight levers of change model and practical strategies for making your next organizational change a success. Author, Tom Kelly uncovers the strategies used by the world-famous design company, IDEO used to ignite innovation and critical thinking throughout an organization. Kelly pulls from his nearly 20 years of leading IDEO to identify ten roles employees can play in an organization to develop new and innovative ideas. The book as a variety of practical stories that guide how to use the same concepts and practices to development a culture of innovation. Every leader wants to improve the performance of their employees. Author, David Rock explores that changes in human behavior are a direct result of changing the way people think. Helping others to be better at critical thinking and problem solving are cornerstone components of being a “Quiet Leader”. This book provides a practical, six-step guide for making lasting performance changes in the work place by unlocking higher levels of productivity through improving critical thinking. Educators will like the brain-based approach that is used to help improve your own performance and those you lead. Entrepreneurial leadership in education is becoming a growing topic. There is so much that school leaders can learn from entrepreneurs and apply those same skills to daily practices. Author, Jack Leonard provides practical actions steps and insights for teachers, school and district leaders, to make educational institutions more innovative organizations. Michel Fullan is no stranger to the field of education. This book takes a “deep dive” into system thinking and what it really takes to change the largest of organizations. This resources is a comprehensive action plan for implementing and being successful at whole system reform. The author sites his work with large school districts in the United States, England, and Canada. Topics explored in more detail include: the importance of whole-system reform, deceptive inadequacies, collective capacity at the school and district level, the current state, individual capacity, politics and professional unification. Overcoming obstacles and barriers are part of being a leader in order to implement an initiative effectively. Author, Rick Hess argues in his book that it is often policy, regulations, contracts, and case-law that often stands in the way of would-be reformers from transforming their educational organization to new places. Hess points out in his book examples from school and system leaders that have “cage-busted” through the obstacles and constraints to make for lasting improvements in education. This book provides insights how to cultivate and maintain powerful cultures to improve teaching and learning.